Let's say you have a vacation planned to Maui. You want to let the group know that you'll be out of office for awhile, but you don’t want to clutter group member inboxes with an invitation describing your out-of-office plans. With the group calendar, you can schedule your out-of-office event and opt out of sending the event to others. When group members check the group calendar, they'll see the dates you're out. Of course, if you want your group members to receive notifications of your vacation plans, you can do that, too. At the bottom of the page, select to open Calendar. In the navigation pane, under Groups, select your group. If you have multiple calendars open, the events for each will be displayed. Each calendar is color-coded as indicated in the navigation pane. In split view, the title of each calendar is displayed at the top. At the top of the window, select My calendar and then select the group calendar. Fill out the details of your absence, including name, place, start and end dates, and, if desired, a personal note. Select the All day check box if you'll be out of office for more than a few hours. At the top of the dialog, select Busy and then select Free. Next to Remind me, select Never. To send the invitation to the group members, select Invite members at the top of the dialog. Select Save. If you've included group members on the invitation, you'll select Send instead. In the navigation pane, under Groups, select your group. If you have multiple calendars open, the events for each will be displayed. Colored tabs across the top indicate which events align to each group. Select New > Calendar event. Under Save to calendar, choose the group calendar from the drop-down menu. Under Show as, select Free. To send the invitation to the group members,, select the Send an invitation to the group check box. At the bottom of the screen, select to open Calendar. 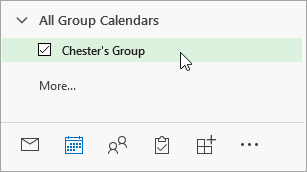 In the navigation pane, select All Group Calendars and select your group. If you have multiple calendars open, the events for each will be displayed. If you have multiple calendars open, select your group calendar. Select Home > New Appointment. Next to Show As, select Free. Next to Reminder, select None. Select the All day event check box if you'll be out of office for more than a few hours. Select Save and Close. If you've included group members on the invitation, you'll select Send instead.